There are a number of cleared cybersecurity jobs out there. Find out what cybersecurity salary you can expect. This infographic is based on a comprehensive earnings survey that was administered online by ClearanceJobs.com from October 30, 2012 to January 21, 2013. The complete 2013 Security Clearance Compensation Whitepaper can be downloaded at about.clearancejobs.com/salary/security-clearance-compensation-survey. 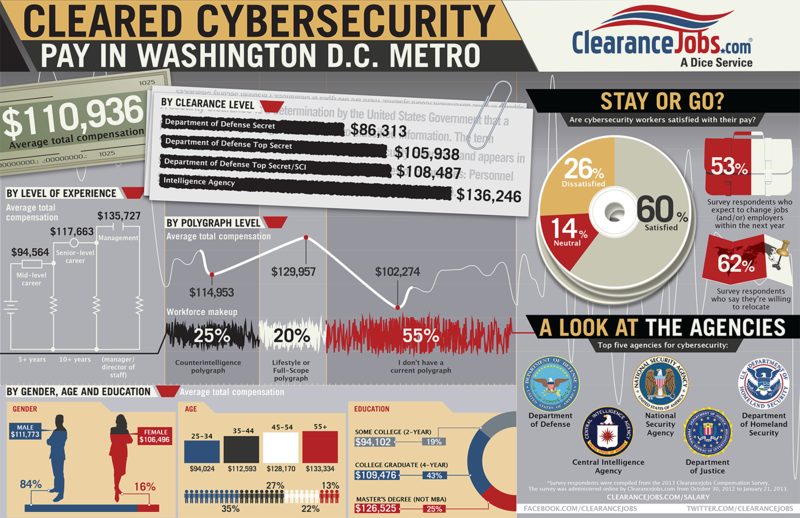 Security Cleared Jobs included in the cybersecurity salary infographic figures above include Information Assurance Specialist, Information Assurance Engineer, Penetration Tester, Security Engineer, Cyber Security Analyst, Information Assurance Analyst, PKI Engineer, Cyber Warfare Network Engineer, Security Engineer, Counterintelligence Cyber Operations Analyst, Malware Analyst, Vulnerability Assessment Analyst, and more.